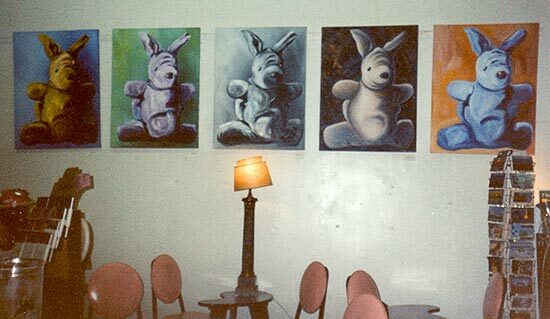 Back in 1992 I painted a series of kangaroos. It all started when I spotted a little plush puppet of a kangaroo in a toy store. It went home with me and the rest is history. What followed was a real bender of painting Vector in different sizes (mostly 30' x 40' though), but in the same exact pose. Everyone always reacted to Vector very positively as in 'OH! I love the bunny!' Sometimes comments were made about how reminiscent he is of the Velveteen Rabbit. So compliments were humbly accepted and gentle reminders were made regarding his species. When I shared a draft of a painting of a very disgruntled rabbit with my friend Claps, he reminded me about Vector. Once in the early 90's Vector starred in a show at the Three Birds Bookstore in Ybor City (in the good old days before Ybor turned into bar alley). Now it turns out that maybe Vector is a rabbit stuck in a kangaroo body? and the destruction of another Tomek original from the 1990s era. now reorganized on another canvas. it was a gorgeous piece, but too much for my walls and the Dorie Cox Museum was not yet open to house it.